Learn how to create a customized tag. Each account comes with an array of previously populated tags. The tags already included in each account are considered 'Global Tags'. Along with the 'Global Tags' users are able to create customized tags in order to enable our automated marketing to work. When a user tags a person, we then know what to do. A Tag is a way to label a person in order to easily search for them or launch a campaign to them. Locate the 'Advanced' module to the left hand side of the page. Locate the button 'Create a New Tag' below your name and above 'Actions'. Click on it. Tag: This is where you would enter your desired name for the custom created tag. When creating a tag, do not use any special characters (-#@%+). You are limited to letters, numbers, and spaces. Alias (optional): This is where you are able to add a secondary name for your customized tag. Example: If you enter 'Pool' as the Alias, you will have to search for 'Pool' to find that tag. Even if you have given your tag a name in the tag bar. If you leave the Alias bar blank. The tag name will be the main name. Note: You cannot change the name of Global Tags, but you are able to give them an Alias instead. The Alias will always override the tags main name. An Alias tag works for both Custom and Global Tags. Include in Shortcuts: If you would like to have a shortcut to leads attached to this tag, you are able to include a shortcut. Select 'yes' or 'no' depending on your preference. The shortcut will be included in the 'People' drop down menu located at the top of the page. Days After Tagged To Expire: This option will allow you to decide in how many days you want the tag to expire. Expire means the tag will be removed. Enter 0 if you do not want the tag to expire. After making your selections for each option click the 'Save' button. The Tag will now appear in the Tag Page search results. 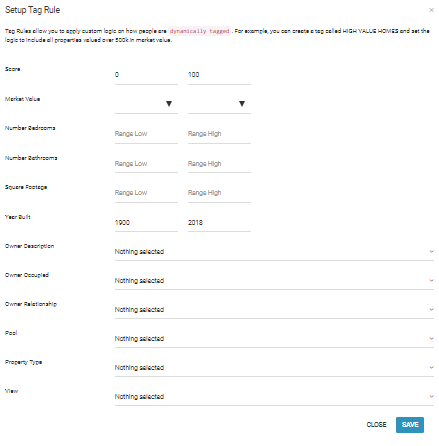 Tag rules allow you to apply custom logic on how people are dynamically tagged. For example, you can create a tag called 'High Value Homes' and set the logic to include all properties valued over 500k in market value. You are able to select score, market value range, number of bedrooms, square footage, year built, etc. Once you have made your selections, click the 'Save' button. You will need to 'Run Rule' after you have set up the rule. Click on 'Actions' again and then select 'Run Rule'. Search Terms: Creating, create, making, make, adding, add, custom, tagging, tags, tag.